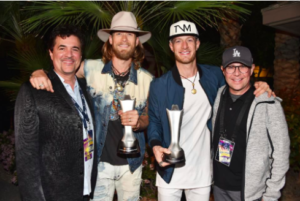 NASHVILLE, TN (April 13, 2018) – Big Machine Label Group heads into Sunday night’s 53rd Annual Academy of Country Music Awards with already two wins in the New Artist categories. The label group is home to this year’s host and has six appearances slated for the show with 12 total nominations. Sixteen-time ACM Award-winner Reba McEntire returns as the host of this year’s event for the 15th time. Nominated for Female Vocalist of the Year, the iconic entertainer continues to break barriers and add to her brand portfolio. Reba was recently named the first female and musician to portray KFC’s iconic founder Colonel Harland Sanders in the brand’s celebrity colonel campaign. Florida Georgia Line are nominated for Duo of the Year and will perform the smash hit “Meant to Be,” their multi-week No. 1 with Bebe Rexha. With this song, FGL has three of the five longest-leading Hot Country Songs ever on the Billboard chart. They continue to prove their dominance selling out stadiums and crossing over to Pop radio with intriguing collaborations. Sugarland, who unveiled yesterday a forthcoming collaboration with label mate Taylor Swift, will also appear at the ACM Awards as presenters. The superstar duo will release their first album in six years on June 8. Earlier this year, Fast Company named BMLG one of the Most Innovative Companies in the world.